This Lean Bean Salad is the easiest to make no-cook side dish out there featuring two kinds of beans, red onions, parmigiano-reggiano cheese, and fresh herbs all tossed in a sweet and zippy dressing. I've been browsing through some of my cookbooks lately and I came across this recipe in one of my older books that I haven't opened in years. I had dog-eared the pages of the recipes that had struck my interest many many years ago. What's funny is that this isn't one of the recipes I had bookmarked. My tastes have definitely changed as the years have gone by. Back when I was dog-earing cookbook pages, I would have neve eaten a garbanzo bean. Honestly, I thought they looked funny, like little brains or something, and I just had a mental block abut eating them. Now, however, I think that garbanzo beans (also known as chickpeas) are the bees knees! I LOVE them! 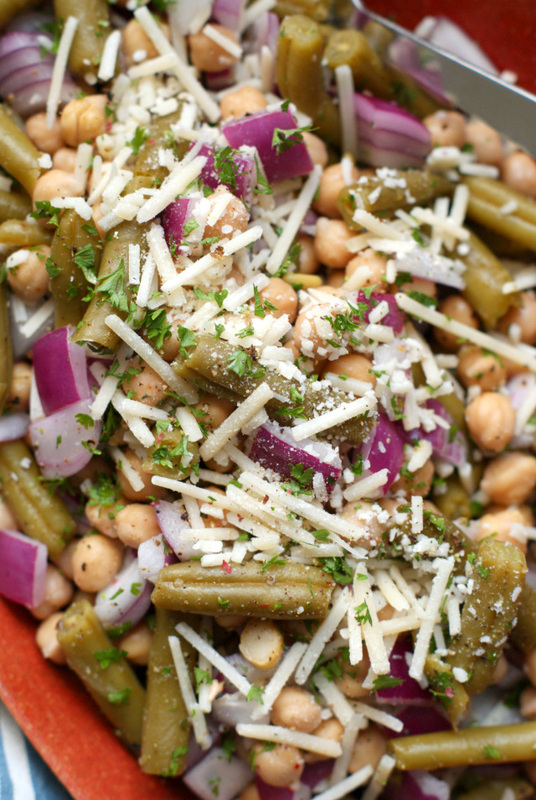 This bean salad not only showcases chickpeas but green beans, too! You could totally make this recipe with fresh beans, but one thing I really love about this recipe is how amazingly easy it is to throw together. Fresh beans would need to be trimmed and cooked before adding to the recipe, which isn't that much trouble. But, if you like canned beans, too, (like I do!) you'll usually have a few cans in the pantry ready to go, no cooking required. The two kinds of beans are dressed up with some crisp red onions, bold parmigiano-reggiano cheese, and a sweet and tangy homemade vinegar-based dressing. The combo of flavors goes together really well and the result is a light and simple side salad. I'm so happy I found this recipe in one of my old cookbooks. Yay for healthy recipes, and yay for old books! This easy to make side dish would be great served alongside turkey burgers, baked chicken, or even a simple meatloaf! 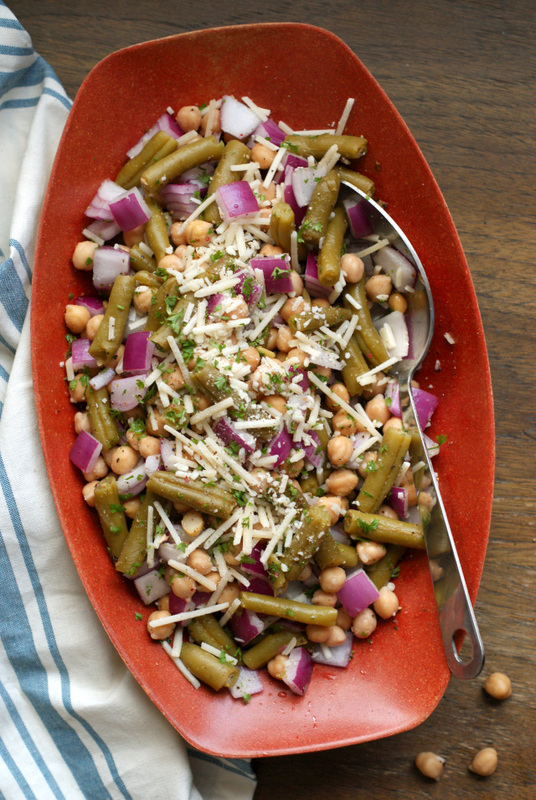 What would you serve this Lean Bean Salad with? In a small bowl, whisk together the vinegar, sugar, parsley, garlic powder, and black pepper. Drain beans well. 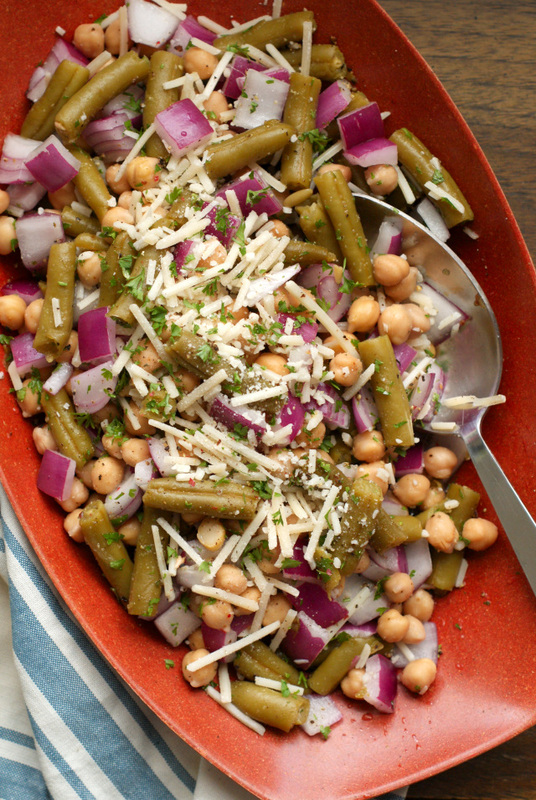 Combine the beans, red onion, and shredded cheese in a large bowl. Pour the dressing over everything and gently toss with a large spoon to combine. Top with additional shredded cheese, if desired. May be chilled or served immediately.